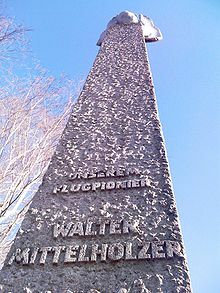 Picture - Mittelholzer memorial at Zurich Airport. Walter Mittelholzer (April 2, 1894 in St. Gallen - May 9, 1937 in Styria) was a Swiss aviation pioneer. He was active as a pilot, photographer, travel writer, and also as one of the first aviation entrepreneurs. Mittelholzer earned his private pilot's license in 1917, and in 1918 he completed his instruction as a military pilot. On November 5, 1919 he co-founded an air-photo and passenger flight business, Comte, Mittelholzer, and Co. In 1920 this firm merged with the financially stronger Ad Astra Aero. Mittelholzer was the director and head pilot of Ad Astra Aero which later became Swissair. He made the first North-South flight across Africa. It took him 77 days. 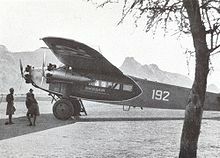 Mittelholzer started in Zurich on December 7, 1926, flying via Alexandria and landing in Cape Town on February 21, 1927. Earlier, he had been the first to do serious aerial reconnaissance of Spitsbergen, in a Junkers monoplane, in 1923. On December 15, 1929 he became the first person to fly over Mt. Kilimanjaro, and planned to fly over Mount Everest in 1930. In 1931, Mittelholzer was appointed technical director of the new airline called Swissair, formed from the merger of Ad Astra Aero and Balair. Throughout his life he published many books of aerial photographs. He died in 1937 in a climbing accident on an expedition in the Hochschwab massive in Styria, Austria. Among other Swiss air pioneers, he is commemorated in a Swiss postage stamp issued in January 1977. Im Flugzeug dem Nordpol entgegen: Junkers'sche Hilfsexpedition fx�r Amundsen nach Spitzbergen, 1923 (with Kurt Wegener, Adolf Miethe, Hans Boykow). Orell Fx�ssli, 1924. Die Schweiz aus der Vogelschau: 274 Abbildungen aus der Sammlung von Walter Mittelholzer (with Otto Flx�ckiger. Eugen Rentsch, 1926. Persienflug (with Otto Flx�ckiger). Orell Fx�ssli, 1926. Kilimandjaro Flug. Orell Fx�ssli, 1930. Alpenflug (with F. Hass, Hans Kempf, Willi Fritz Burger). Orell Fx�ssli, 1930. 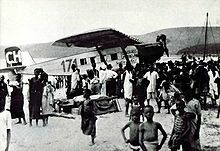 Picture - Swissair Fokker F.VIIb-3 m (CH-192) piloted by Walter Mittelholzer in Kassala (Sudan), February 1934. 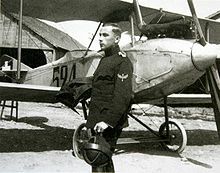 Mittelmeerflug, mit 120 Fliegeraufnahmen und einer Einleitung (with Gustav Ehrhardt). Rascher & cie, 1930. Tschadseeflug: Mit dem drei-motorigen Fokker der Swissair durch die Sahara zum Tschadsee (with Auguste Piccard). Schweizer aero-revue, 1932. Abessinienflug: Mit dem dreimotorigen Fokker an den Hof des Negus Negesti. Schweizer aero-revue, 1934. Fliegerabenteuer (with Willi Rickmer Rickmers, Werner von Langsdorff). Brockhaus, 1938. Die Schweiz von damals, 1917-1937: 350 historische Flugaufnahmen (with Walter M. Borner). Weltbild-Verlag, 2005. ISBN 3038121045, 9783038121046.